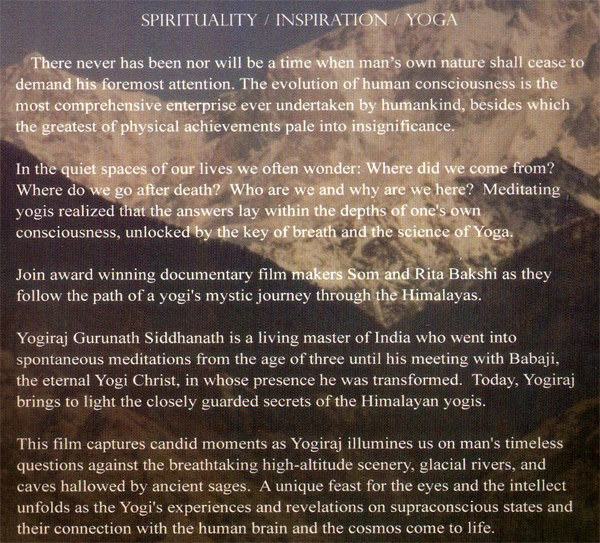 The subject of the documentary is the Indian Master Yogiraj Gurunath Siddhanath of the ancient Nath yogic lineage. Born into an Indian royal family, he was spontaneously meditating even at the tender age of three. He has empowered tens of thousands into the science of Self-Realization called Kriya Yoga. Yogiraj travels and teaches throughout the world giving love and light to all. The journey of a Self-Realized Master into the mysterious Himalayan mountains as he relates his experiences in the midst of the awesome heights of snowy peaks and profound caves. The Yogi pours out his teachings from the depths of the soul with the blessings of the immortal called the ancient of days or Babaji. Yogiraj transmits healing energy with the sound of his voice and through vibrations of his image. The viewer is transported into higher dimensions of reality. From the stillness of the Himalayan peaks, Yogiraj brings to the thirsty and distressed, a message of healing and peace. Follow the footsteps of a Yogi and experience through his words, as he walks his talk in the jungles, temples, ashrams and hidden [to the uninitiated] places of India. Enrich your life with the secret oral traditions revealed for the first time - mysteries of life, immortality, and Self-Realization. Not since the "Autobiography of a Yogi," written over 60 years ago, has a Master brought the message of Mahavatar Babaji to the world for a new millenium. The author details his remarkable experiences with Babaji, insights on Kriya Yoga, healing, the spiritual hierarchy, supra-conscious states of yoga, meetings with great beings, and his mission.